End 2 End (and back again) is a 92km off road cycling challenge, in aid of the Earl Mountbatten Hospice, that covers the breadth of the Isle of Wight between Culver Down and Alum Bay. Taking in some of the Islands best off-road trails, including the famous Tennyson Trail, the event is a real test of endurance and navigational skill. Cyclists can choose to either go End 2 End (46km), finishing at the majestic Needles at Alum Bay, or go End 2 End – and back again (92km), turning round at Alum Bay and making their way back to Culver Down via any off-road route. 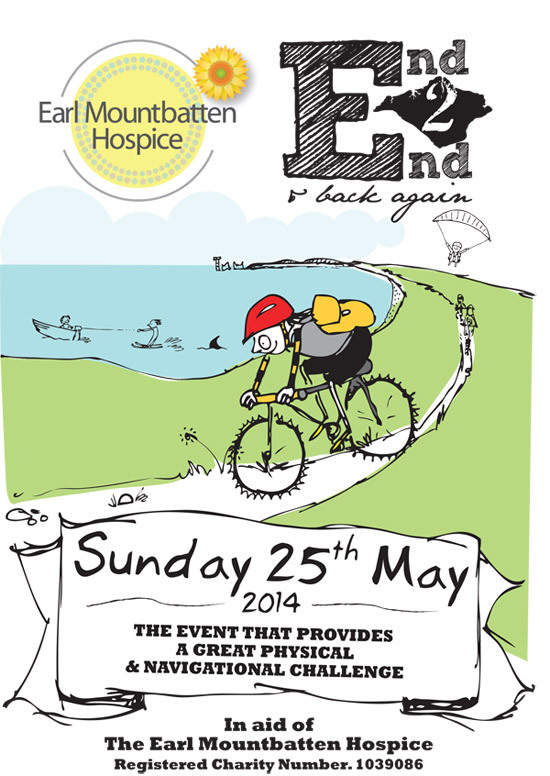 End 2 End (and back again) is the brainchild of David Issac, a doctor at the Earl Mountbatten Hospice. Combining his passion for cycling with his commitment to the work of the Hospice, Dr Issac and the Hospice fundraising events team launched End 2 End in 2011. A popular feature of the End 2 End experience is the now legendary halfway checkpoint spread at Snowdrop Cottage in Gatcombe, provided by David’s wife, Jane. It’s rumoured that cyclists take part for the promise of a slice of her renowned bakewell tart alone, and jostle for position in the queue for John’s (David’s brother-in –law) famous bacon rolls. Participants pay just £10 to register, and all funds, sponsorship and donations received go directly to patient care. Registration is easily done over the phone by calling the Hospice on (01983) 528989 with your credit/debit card details. Earl Mountbatten Hospice is a registered charity, No. 1039086, and a company limited by guarantee, RCN 2929267. Registered office: Earl Mountbatten Hospice, Halberry Lane, Newport, Isle of Wight PO30 2ER.